I don’t consider myself a critic; personally I resent the term. In spite of a movie’s inadequacies there is usually much to admire, or if not at least some potential on offer. For every cinematic faux pas there is an ingenious turn of direction or standout performance. Someone, somewhere, will make the most of a bad situation. There are some productions, however, that are destined to fail; movies where artistry is so peripheral that those involved barely have a chance to make their mark. I’m talking about modern studio reboots, those films which serve no other purpose than to slash expenditure by saving on promotion and advertising. There’s nothing financially safer than a studio rehash, and as a consequence nothing lazier. As far as executives are concerned what they have in their possession is a done deal, one in which little or no effort is required in order for them to reach their financial goal. As a result, sequences are rushed, classic moments are slung back into the fray as little more than contrivances, and in some instances those at the helm are given too much freedom. I mean, what the hey! Who cares? This one is a banker! But people do care, more than they would about the outcome of any original production. Movie goers have a lot invested in these characters, and they tend to take it personally when they are misunderstood or misrepresented. Those who make all the decisions seem to think that ‘modern’ automatically translates to ‘better’. With today’s technological advances, how can one fail? The answer is, quite easily. In fact, with that kind of attitude failure is pretty much a given, and so is the backlash when fans inevitably leave cinemas feeling short-changed. 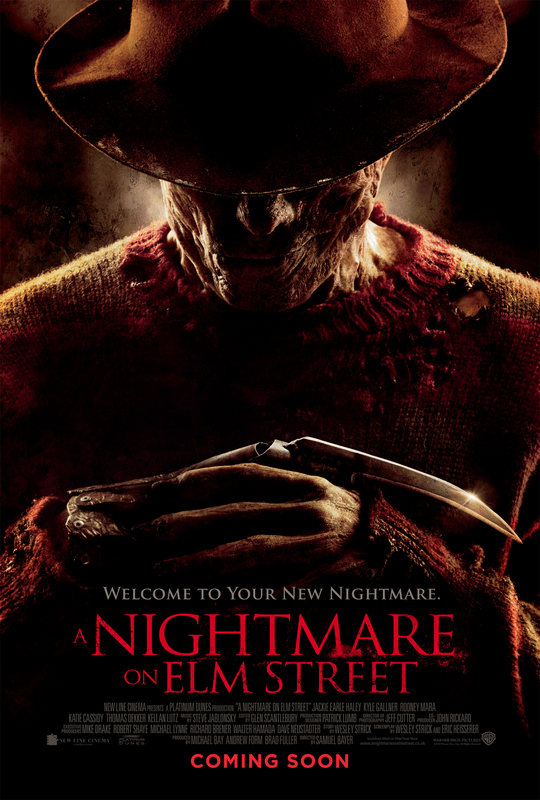 Of all the recent horror reboots, 2010’s A Nightmare on Elm Street is the one that hit the hardest. Any chump in a mask can play Jason or Michael Myers, but try separating Robert Englund from Fred Krueger at your peril. They tried as much in Freddy’s Revenge, only to cave in after one day of shooting, and almost fifteen years later they tried it with actor Jackie Earle Haley, and look what it did for his career. Perhaps aware of this poison chalice, director Samuel Bayer has not only gone for a different look, but an entirely different approach, and it is never a wise move to tamper too heavily with the classics. Haley is a fine actor, and is great in the role of a perverted monster, but without the gunslinger stance and mocking relish it’s not Freddy. It’s just a man with a burnt face wearing a red-striped jumper. Close your eyes and this is any generic murderer you care to mention, but it’s not Freddy — not the one we all know and love. In large part, 2010’s effort is a needless retread, and any innovations it attempts to make are detrimental to the legacy of its central character. When it comes to reprehensible figures like Krueger, less is definitely more. There are rules and limits to what constitutes enjoyment, and when you’re dealing with depraved child murderers the further away we are from reality the better. The original story was palatable because our menace was of the supernatural variety. What you don’t need is an in-depth psychoanalysis of the monster beneath the mask. The spin here is that Krueger might be innocent. After watching their friends get butchered in their dreams Nancy (Mara) and love interest Quentin (Gallner) become suspicious, particularly when Freddy begins to drop hints that he was wronged and is out for revenge. Those suspicions grow when the two of them find a kindergarten photo of the whole gang together. This is strange since they don’t remember meeting until college, and we quickly realise that the whole town is under a cloud of repressed memories that Krueger is determined to claw his way out of. That is all I will say about the actual plot. More interesting is the movie’s misuse of its supporting cast, particularly the immensely talented Gallner. What happened to the likes of Heather Langenkamp? Where is the naive Tina or her misunderstood, drug-addicted boyfriend? It is the weaknesses of these characters which make the original so absorbing, which make its antagonist so deliciously terrifying. All we have here are a cast of box-fresh, MTV fodder lining up for the slaughter. But the most infuriating aspect of the movie are the dream sequences themselves. For the original, Craven really relished in the concept. Not only were his dreams creative, they were authentic in their execution, seamless in their transition. Take iconic scenes such as the claw appearing in the bath or Freddy’s leering impression in the wall above Nancy’s bed. In 1984, special effects maestro Jim Doyle worked minor miracles with nothing more than a sheet of spandex, and with all the technological advances in the world this proves to be the laziest and most ineffective rehash of all, resulting in the kind of crappy CGI that is an insult to anyone who has ever taken pride in their craft. These were the kind of moments which set the original apart, which lingered on the periphery of the subconscious and flashed in a manner which made you wonder where the dream began and where it would end. Here, it never seems like a dream, even when the characters are so obviously dreaming. Gone are the slight intimations and mind-bending transitions which left you hanging on the precipice of uncertainty. What we have instead are blatant changes in lighting or a frantic blurring of the screens edges, the kind of uninspired delineations that drain the concept of all originality. So lift your glasses to all those brave, creative people drowning in the corporate quagmire, and drink to those who were unable to swim clear of its insidious stigma, because 2010’s A Nightmare on Elm Street is cynical filmmaking of the highest order. Lazy, devoid of imagination, and lacking the love or care to do justice to one of horror’s most iconic creations, this pseudo-dreamworld will put you to sleep long before the sequel-setting conclusion is able to give you nightmares. Yes, C.J., I tried to give this a whirl but could not get behind it at all. I don’t understand Hollywood’s fascination with reboots where they try to recreate a moment from the past that is like lightning in a bottle. Personally, more people should take a hint from Sam Raimi and if they want to redo their films, treat them like an entirely new film. Retain the concept but change the names of the characters. Obviously, you would have to keep Freddy but give the female another name not Nancy. Terrific review. I think we can safely equate Hollywood’s fascination with the reboot with their fascination for a quick buck. Modern Capitalism has led to the degregation of art in many forms, and is usually tied in with commercialism. Sadly, art is now more of a commodity than it ever was, and its content is invariably determined by corporate representatives tasked with turning optimum profit. That kind of control began in the early 90s when Blockbuster forced Nirvana to change the title and cover of their album so they could advertise it in the tweener isle. Now, the major corporations actually have input in the content of albums, and groups are aware of commerical boundaries when they write the content of their records, which is why music has lost its anarchic qualities, and also why we have so many reality music shows in which pretty people sing corporate-scribed peaches, taking the songwriting power, along with the rights, and ultimately the money, out of the artists’ hands. If you’ve ever wondered why ‘they don’t make them like that anymore’, there is your answer. The only time I could get behind a remake (I suppose the term “reboot” was borrowed from the computer age) is if the original film was either really obscure or lackluster. Unfortunately, that’s really never the case, so I don’t like remakes due to their lack of creativity & originality. That being said, I have watched certain remakes, and this here is one of them. The best I can say about it is that I thought Katie Cassidy did a good job (I generally like the performers in the film, but in other projects). I don’t regret viewing it, but I’ll stick to the 1984 film. It’s sad what corporations have done to the potency & organic nature of modern music; I used to buy, buy, buy and not sell out, but I guess musicians don’t have the same choice the consumer has. All creative industries have become heavily regimented. Reboots are generally cookie cutter productions whose only purpose is to slash expenditure and reach a readymade audience. As for music, I’m mostly stuck in the past. There’s plenty out there to find, and I come across excellent music all the time, but hardly any is given a mainstream platform. At the moment I’m indulging in some jazz fusion (Herbie Hancock, Jean Luc Ponty) and some of Faltermeyer’s 80s synth. Today, mainstream musicians are generally products of the production line. They look pretty, are taught how to sing and sell an image and have no songwriting royalties. Everything is calculated and the money ends up in corporate hands. That’s capitalism. Gone are the days when mainstream artists are able to rise up independently and become broadly influential based on the force of their own conviction. I think Nirvana’s In Utero was a turning point. They’d become so popular Blockbuster wanted to sell their CD in the kids section and the title of their album was changed. After that, titles and lyrics had to be approved before recordings were released, and eventually labels began manufacturing their own stars from scratch; they went from having a creative input to having songs written in a consumer friendly way that didn’t alienate a broader audience. Sad really. Still, all you have to do is escape to your local jazz venue to see a wealth of unsigned talent. In regard to reboots, ANOES (2010) is about as cynical as it gets for me. It was really offensive.